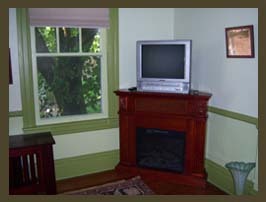 Enjoy views of the rail trail, canal, and the Potomac River from your private porch. 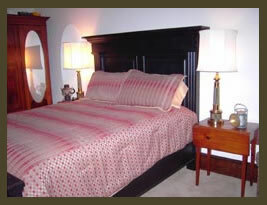 Comfortable queen bed awaits after relaxing in the jacuzzi tub/shower. 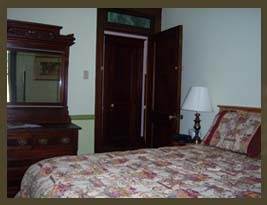 This 2-room suite offers a connecting bath with jacuzzi tub/shower. 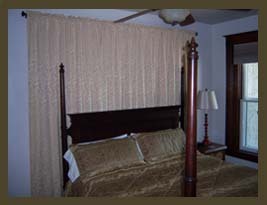 The bedroom has a comfortable queen bed. 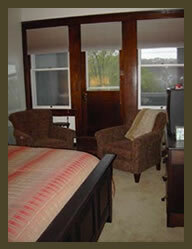 Sitting room has a double Murphy bed for 2-room sleeping. Can acommodate up to 4 people. Peaceful sleeping in this two-room suite. Use your own entrance and sitting room for extra spaciousness and privacy along with the extra sleeping using the Murphy bed. 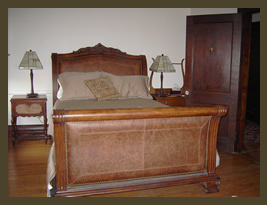 Queen leather sleigh bed and fireplace offers comfort at the end of the day. 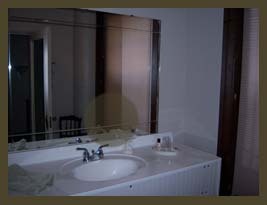 Large ensuite bath with shower completes the room. 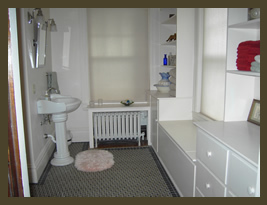 The prior doctor's office is now a luxury first floor bedroom with king bed and ensuite bath with shower and dressing area. What a place to rest after an exciting day. Large shower and plenty of room for all your accessories in the comfortable bath. Ask about our discount for 3 or more days.